I was asleep at the wheel and did not remember to get this post written and scheduled ahead of time. I have been busy with lots of quilting. I have also been helping my husband set up a new website, which I hope I can share with you soon. Excuses aside, I do look forward to Jenn @A Quarter Inch from the Edge‘s monthly Throwback Thursday link party, and today I want to show off the baby quilt I made when my cousin Beas was expecting her first child (pronounced like yellow and black honey making bees). My mom and I made the quilt together in a week back in January of 2010. We selected the fabric together, I did all the sewing / quilting, and she did all the ironing. It sure is handy to have a buddy iron for you! 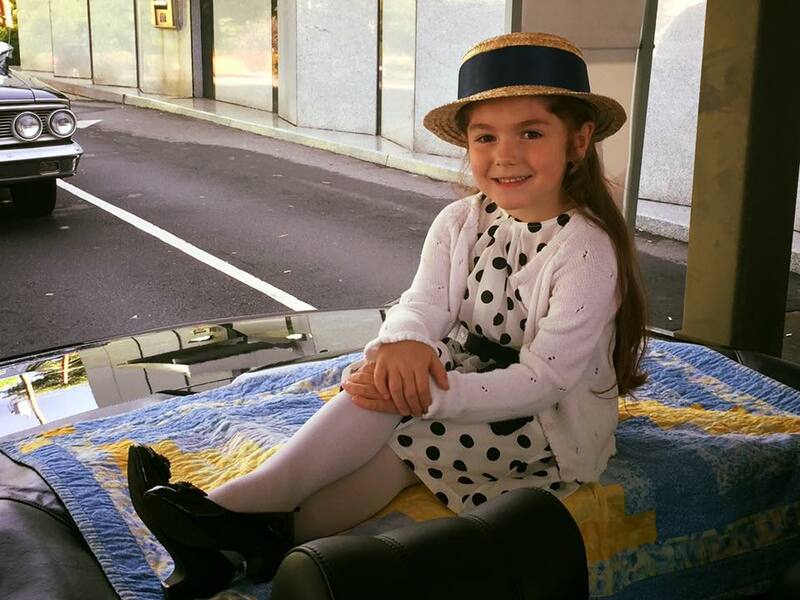 That means baby Dare is now 5. Where has the time gone? Beas and Dare actually are both named Stephanie, as is the matriarch of the family. Since all 3 of these beautiful women share a first name, they have found nicknames along their paths in life. Dare Bear is a sweetheart and my husband has fond memories of her sitting on his lap in the calm hours leading up to my brother’s wedding in April 2012. She politely asked him for some of the “trees” off of his plate, which he was thrilled to offer her once he realized she wanted some broccoli. I was a bit nervous about making and gifting a blue and yellow quilt for a baby girl as I wasn’t sure if they would prefer something more “girly”. However, Beas assured me quickly that it was perfect – even the perfect shade of Tar Heel blue. And as the photo above from this past weekend suggests, the quilt is being used and loved which makes my quilting heart happy. The quilt is made of log cabin blocks and the pattern and fabric came from a local quilt shop here in my town. This may have been the first quilt I used a walking foot to do the quilting on, and I recall taking a loooooong time to quilt each heart in the center of the log cabin blocks. Linking up to Throwback Thursday. Isn’t it wonderful when baby quilts are actually used? My daughter sent me a message last night that a picture of my grandson sleeping with his quilt. It just warms my heart! It always warms my heart when people I have made quilts for take pictures and I can see my quilt somewhere in them. I think the blue and yellow made a sweet quilt for a little girl. Yvonne, I enjoyed your post and really adore the quilt. My mom has my first log cabin quilt laying over the back of her recliner, used frequently. Mom pointed out a couple of areas that the fabric has now shredded and therefore some of the seams are coming apart. I offered to just make her a new one, especially after looking at the horrible binding job I did…seriously it is pathetic! But she refused and said she will just hand sew it for the fix now. Thank you for sharing and have a wonderful creative day! So pretty, I love blue and yellow! Very sweet! This is my mother’s favorite color combo. I have been collecting for a quilt for her – one of these days I will get it pieced – if only she lived near to do the pressing haha! Great quilt and story. It’s interesting how people end up with nicknames. I love your story and I love the little blue and yellow quilt. Perfect for a baby and so nice that it is still being used. I think the blue and yellow is perfect for her! It reminds me of a field of cornflowers in the sun. And doesn’t it give your heart such joy to see someone actually using a quilt you’ve made. It’s not even mine, and that photo made me happy. I love the color combination in this quilt–it’s like blue sky and sunshine! Don’t you just love when you see your gifted quilts in use? What a sweetie! Oh, and please send your mother over to my house. I absolutely detest pressing seams. And that’s saying a lot because there isn’t much about quilting that I don’t love. This is a beautiful, sunny summer day of a quilt Yvonne! Dare is so adorable too! 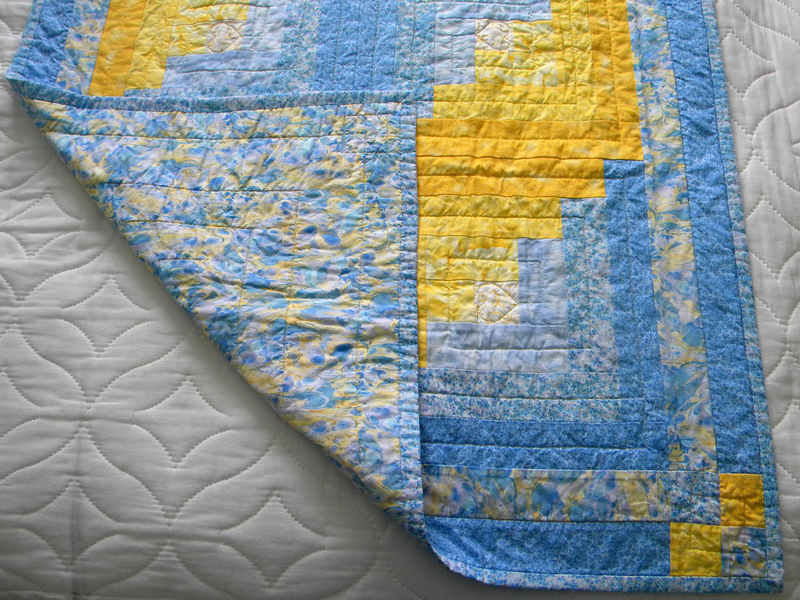 I have always loved blue and yellow quilts. What a sweet quilt for a darling girl. Oh I missed throwback Thursday, bummer. I have to put it on my calendar. But I’m glad to see yours. I actually think that blue is quite stunning myself. Blue and yellow are pretty much my favorite colors at the moment, so I love it! Fun to make it with your mom, too. What a great quilt! And it has led a life that every baby quilt hopes for! Awe! It is a lovely quilt for a sweet girl! One of my early quilts was in a similar colour and style. Snap! Dare looks gorgeous sitting on your quilt, and love her chosen nickname! 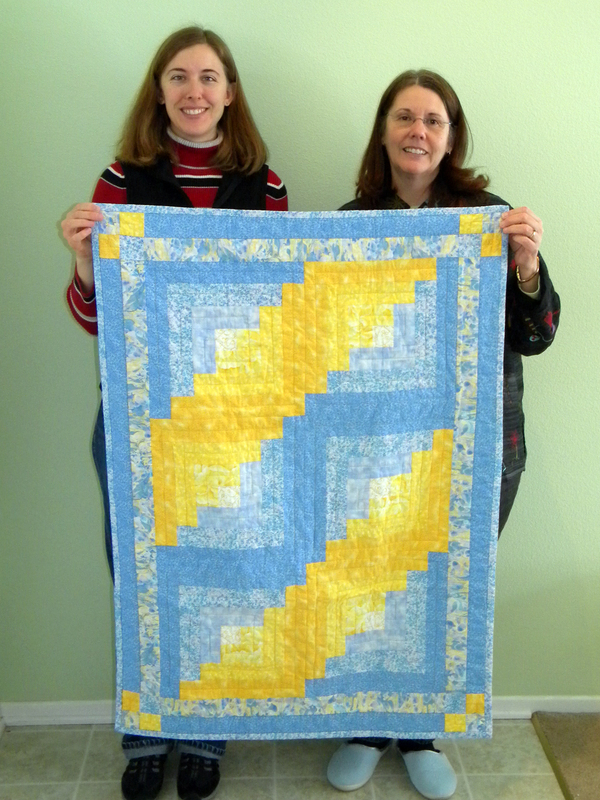 Your quilting was amazing even way back then, and blue/yellow is such a happy combination. There really is nothing better than seeing a quilt being used! How wonderful that she’s still using her “baby” quilt!